Find the smart money—Market Movers Index shows the ratio of real volume divided into transactions per period, so you can see conviction behind breakouts. Watch a video walk through of this app. Smart money is high volume per transactions. 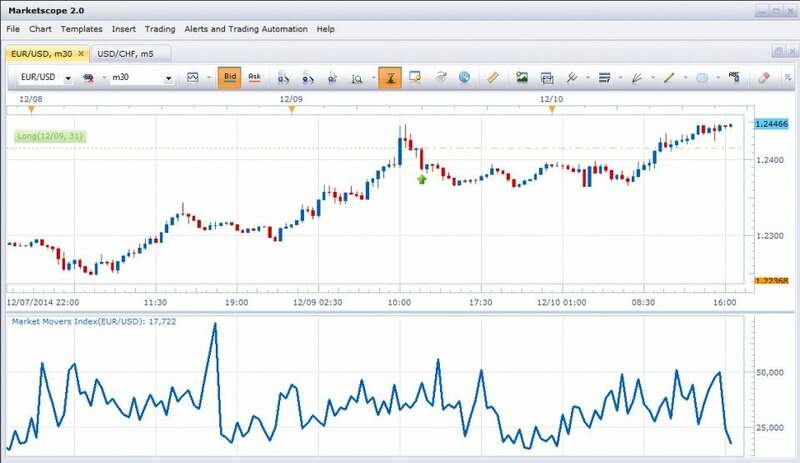 Using FXCM’s real volume, Market Movers Index helps you zero in on specific market dynamics. The Market Movers Index indicator works on multiple timeframes: m1, m5, m15, m30, H1, H2, H3, H4, H6, H8, D1, and W1. You can use these indicators with 14 currency pairs: EUR/USD, USD/JPY, GBP/USD, EUR/JPY, AUD/USD, GBP/JPY, USD/CAD, AUD/JPY, USD/CHF, EUR/CHF, NZD/USD, EUR/AUD, EUR/GBP and EUR/CAD. This app is only compatible with FXCM Trading Station Desktop software. An FXCM live or demo account is required.